The Freiraum project, by Goethe-Institut, connects 38 civil society organisations from different European cities. Under Freiraum, these organisations have formed 19 tandem-pairs to explore the idea of European space in terms of freedom, through projects of local relevance. What questions arise when citizens, scientists and cultural practitioners think of the term "freedom" in a way that is specific to a place? For our local Freiraum project, tandem-partners IFD21 from Prague and publisher Hors d'Atteinte from Marseille, are focusing on questions of democratic participation in the planning and re-making of European cities through large-scale urban development interventions. A research study, a series of film workshops, and 3 short-films developed through participatory art methods, make-up the deliverables of our collaboration. The recent field-trip, which was IFD21’s 3rd trip to Marseille, sought to inform the research component of the project, focusing on the case of Marseille's famous Marche aux Puces (flea market) in the city’s northern districts. Since 1988, the Marche caters to the needs of the local community, one of the poorest neighbourhoods in France, selling cheap food and second-hand household items, and hosting the biggest mosque in the city. This reality is about to change, as the Marche is scheduled for renovation in the near future, as part of the EuroMediterranee2 project, a public-private partnership for urban renewal. 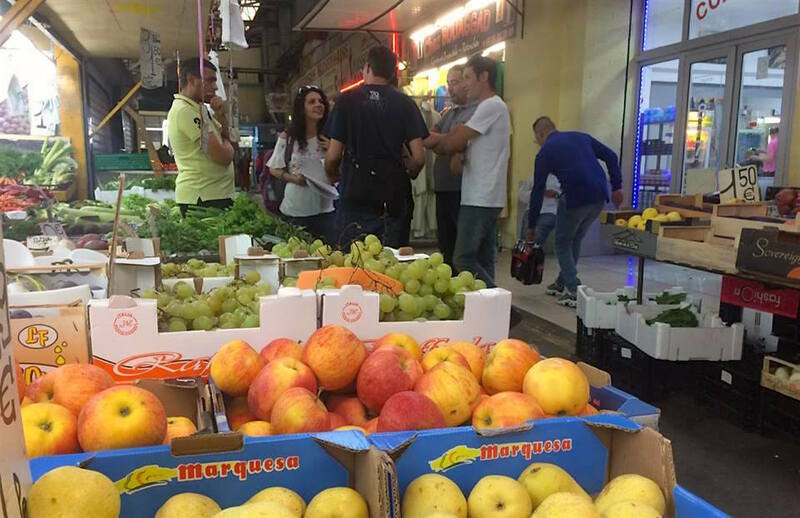 We visited the Marche, the EuroMediterranee offices, and other parts of the city on September 23–28, in order to map the area, and to conduct interviews and group discussions with local residents, flea market sellers, urban planners, and sociologists. The research was animated by a basic question: How well do urban planners understand the needs of the locals in the intervention areas, and how much of a say do citizens have in the planning decisions? The market presented to us a complicated picture of spatial arrangements, community bonds, views about the present and hopes for the future. Located in an old brownfield, the territory of the market is privately owned and consists of distinct areas; a Muslim food market (souk), an antique hall and gallery space, a separate hangar with used furniture and home appliances, as well as an informal outside area where street sellers lay out mismatched merchandise on blankets and makeshift stalls. Many of the people who work there have known each other for 20 or 30 years, and the atmosphere reminded us of a small village. Not everyone however had access to the same information about future plans for the market, or the same expectations. While some of the ‘settled’ sellers for example, had some idea about the renovation plans, and were actually optimistic about the possibility to work in a fresh and clean environment, others, and especially those selling in an informal way, had little knowledge of the future plans, and little trust in the market’s management about securing their livelihood. At the same time, in the EuroMediterranee offices, discussions revolved around different concerns. In the place of the market, these urban planners imagine a 'mixing of the old with the new' within a modern eco-district, complete with parks, office buildings, and residential complexes. They are confident, not only in their knowledge of the city, but also in their previous experience. Since 1995 EuroMediterranee has renovated over 310 hectares in the centre of Marseille, mainly around the old port in the city centre. There are however many new factors that make EuroMediterranee II a very different venture. Unlike the operations undertaken during the 1990s and 2000s, when projects were led, funded, and to a large extent controlled by the state, today the role of private property developers has increased, as they are providing 70% of the required funding. This new reality introduces further questions about the democratic control of the city’s form, the representation of public interest in the planning decisions, and the communication between decision-makers and the public. Even though corporate methods provide a more structured and better regulated environment for communication with the public, such exchanges tend to be one-way, more about delivering information on decisions already made, than consultation and co-designing the city as a shared space. We are taking these findings further in the next steps of this project, planned for November. With the help filmmaker Eva Stotz, we are organising a series of film workshops with local citizens affected by EuroMediterranee’s reconstructions. The workshops will teach these participants how to film themselves, and ask them to describe to us through visual means their own lived reality in this transitional city. Find out more about the Freiraum project here. © 2019 Institute H21, z.ú.